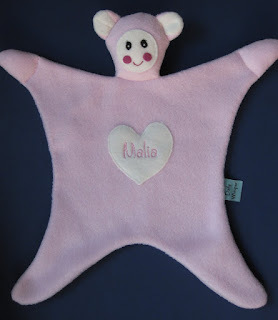 I just finished this comfy doll for a baby named Malia. Comfy dolls are for babies and toddlers. They are meant to be part toy part blanket. This little treasure is 14" tall x 12" wide. The blanket portion or body is 8" x 8". The material is fleece so there is no worry about the baby sucking on the hands or ears, that is what they are there for! What do you think? Should I make more and sell them on Etsy? LOVE the new Comfy look! You are soooo creative!